Recent market indicators and price increase demonstrate why. Bitcoin is once again in the news as the bitcoin/USD price has risen around 35% in October. October also marked a milestone for bitcoin investment company First Global Credit, as trading volume on the platform achieved record growth. Customers traded over $1.4 million dollars’ worth of mainstream stocks and ETFs using bitcoin as collateral margin. This represents an increase of 48% over the previous month’s trading volume following a trend established earlier this year. First Global Credit’s platform allows the use of bitcoins as collateral margin to generate a return trading blue chip and high growth stocks, stock market indices and ETFs. First Global Credit is one of a growing number of companies using bitcoin as an asset to generate a return on investment. This acceptance of the tangible value of bitcoins coupled with the upward trend in bitcoin’s value contradicts recent assertions supported by the press that there is greater interest in developing the potential of private blockchains rather than bitcoin itself. Many feel this refocus of attention on blockchain technology is being championed by mainstream banks as demonstrated by the R3 initiative. This initiative is being led by a consortium of banks publicised as a way to use blockchain technology to decrease consumer costs, but is, in fact a clear attempt by the banks to retain control over the world financial networks. Contrarian company First Global Credit and companies like them are committed to supporting the development of a free bitcoin capital market independent of banks and government. Instead of forgoing the benefits of bitcoin as an independent currency, their strategy is to create services that bridge the traditional economic environment and the digital currency economy. First Global Credit is a company committed to providing the bridge between the opportunities available in the mainstream markets and the digital economy. The company has been founded by financial service professionals with 35 years’ collective industry experience. We strive to provide meaningful services that allow our customers to run their entire fiscal lives through the use of digital currency and we deliver these services with an attention to customer service not generally found in digital currency focused companies. Our processes are designed to assure the privacy of our customers alongside the security of their assets. The company is committed to developing a stable and secure digital currency capital market; to provide an environment which will prove fairer, more accessible, and less costly for the public to transact business than existing banks and financial institutions. 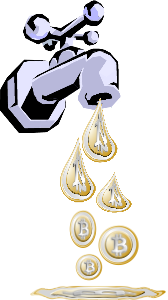 Do you have a leaky Bitcoin wallet? Filippo Valsorda, the engineer that developed the program that checks to see if your network or browser is vulnerable to the Heartbleed virus, today released a tool designed to hunt down wallets that poorly secure transactions and in effect that leak private keys. Mr. Valsorda who works for CloudFlare demonstrated how known flaws in some wallets have allowed thieves to steal Bitcoins due to insecure clients or flaws identified in unpatched browsers. The 59 Bitcoin hack happened in August 2013 and Google was wrongly blamed for the loss. Valsorda also found indications that other hackers were scanning the blockchain for this deficiency and were raiding wallets, but the results were not conclusive. Mr. Valsorda studied the blockchain during his research looking for mistakes and concluded that we would be better protected if we create systems that by default protect transactions when the security design fails. A known flaw in the Elliptic Curve Digital Signature Algorithm (ECDSA) that showed up in insecure clients or unpatched browsers is to blame for the issue. While Bitcoin clients Multibit and Electrum received gold stars for the correct use of ECDSA, blockchain.info did not. However Mr. Valsorda stressed this was not a vulnerability in blockchain.info, but rather in the reliance on what could be an unpatched or outdated browser. The weekend sell-off in the BTC rate vs the dollar had all the hallmarks of a selling extreme triggered by the dumping of BTC into the market. In this case it was triggered by the sale of 26,000 bitcoins in the days leading up to the weekend. The quick bounce following this rout confirms this assessment. All indicators are pointing to at least a medium term rally and a view that we have probably seen the low for the year. While indicators are positive we don’t believe this is a rally that need to be chased. We expect to see opportunities to pick up BTC vs $ at between $320/$330 before the market rallies back up to the $500 level. Above the $500 level we run into significant overhang and may have difficulty breaking through this in the short term.